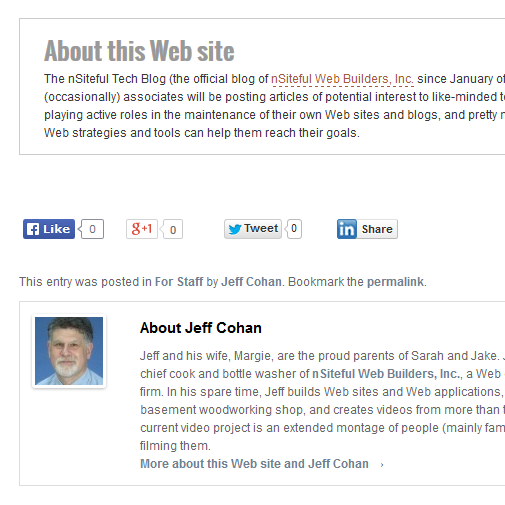 Many blogs display “About The Author” information below each blog post. 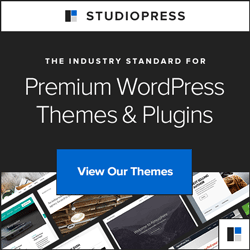 In WordPress, many of the recent default themes (twentyten, twentytwelve, and twentythirteen) innately support the display of an author’s name, avatar, and bio — if the author has filled in his or her bio in the dashboard, that is. Even if themes don’t innately support the display of this information, it’s easy to modify the appropriate theme template with template tags (e.g., the_author_meta) to display the information. 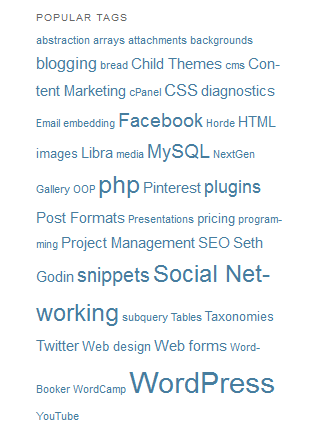 But what about displaying an “About Us” blurb below each single blog post? An About Us blurb could contain information about the Web site or the organization behind it, as opposed to information about the author of the post, which, as explained above, is handled elsewhere. In this article I’ll show you how you can add an About Us blurb that appears below each single blog post. We’ll add this “About Us” information by creating a function and calling a filter. Alternatively, you could place this code in the functions.php file of the active theme. However, since “About Us” information is not strictly theme-related, a better practice is to make the code a must-use plugin, in the event a different theme is ever activated. Markup in your theme’s stylesheet file can determine how this content will be displayed. The code in question uses the the_content() filter. In this sample, I’m displaying the actual code used (at this writing, anyway) for this blog. Let’s examine the code for the About Us blurb. I named the function after_single_blurb(), a unique custom function name that doesn’t match any native WordPress function or any other custom function previously named and declared. It has a single parameter, $content, which is the WordPress variable that contains the contents of the post. Line #2 uses the conditional tag is_single, because I want the blurb to appear only on single-post articles, not on archive pages where the redundancy would be obnoxious. The next four lines simply concatenate (using the .= php operator) custom content (and appropriate HTML tags) to the content that passed into the function using the $content variable. On line #8, we return the new, modified content (in the form of the $content variable). Finally, we call the add_filter function, whose two arguments are (a) the the_content function and (b) after_single_blurb, the custom function that generates the “About Us” content. This way, every time the the_content function is called in a single post, our custom function will be triggered, thus adding the new content. Get creative with your About Us blurbs. WordPress’ many conditional tags (such as is_single) offer lots of cool customization opportunities. Or maybe you want different “About Us” blurbs for each category. Your approach would be similar to the above, except you’d probably want to use the php switch control structure. 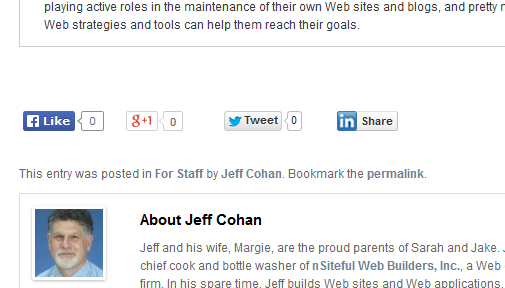 Of course, you’re not limited to WordPress’ conditional tags when it comes to customizing your custom after-post blurb. With the right dose of knowledge of php, WordPress, and CSS, you can make magic happen. Let me know what you think of this little technique, and don’t be shy about asking questions or offering suggestions about how to do things differently or better. Automatic “Visit Web Site” Links on WordPress Portfolio Posts Display WordPress and WooCommerce Tags as Lists Case Study: Emergency Notice Banner for Hybrid Web site Add Dynamic Table of Contents to a Series of WordPress Posts What are WordPress Post Formats, and why should I care?